So, most people’s New Year’s Resolutions include losing weight, stopping drinking or smoking, or being nicer. Mine was to cook more. In order to accomplish this, I have *got* to get more organized. No more jotting down a grocery list with recipes I’m tagging on Pinterest. I have to make a weekly menu, and shop for it once a week, to maximize my time. So..menus. Weekly menus. That’s my plan of action. Tomorrow is my 18th wedding anniversary. It’s a Monday. Blah. Day full of meetings and night full of homework, so no fancy restaurant for us. Instead I’ll fix us something yummy tomorrow, and kind of fancy. The rest of the week we can eat pork and beans, I guess. 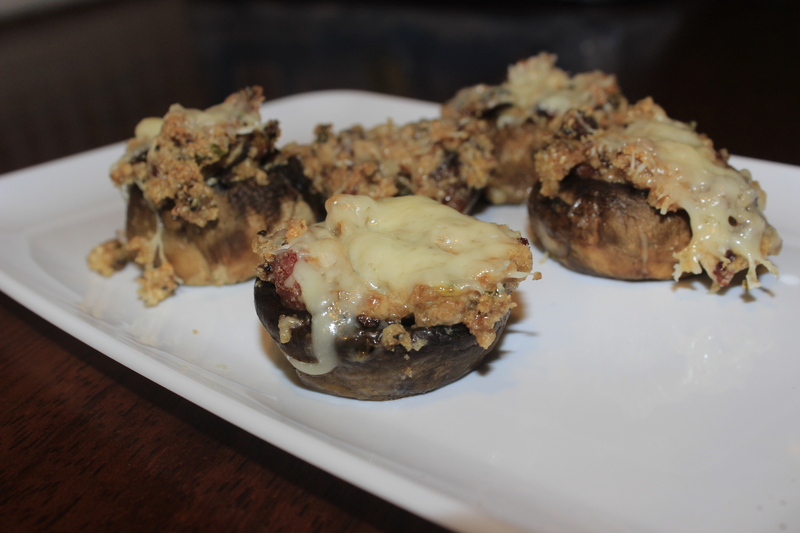 So, for our appetizer I’ll make Bacon Stuffed Mushrooms. It’s been my experience that nothing conveys love more than bacon and cheese. In a large skillet, cook the onions and bacon over medium heat until crisp. Remove the mixture from the skillet and set aside. In the same skillet, add the bourbon and cream cheese and stir constantly until the cream cheese is melted and mixed with the bourbon. Add the onion and bacon mixture back into the skillet and mix together. Add the breadcrumbs, salt and pepper and mix together. Spoon the mixture into the mushroom caps and place on the prepared baking sheet. Bake until the mushrooms are tender, 25 to 35 minutes. Top with some Parmesan and put back into the oven to allow the cheese to melt. Remove from the oven and serve. 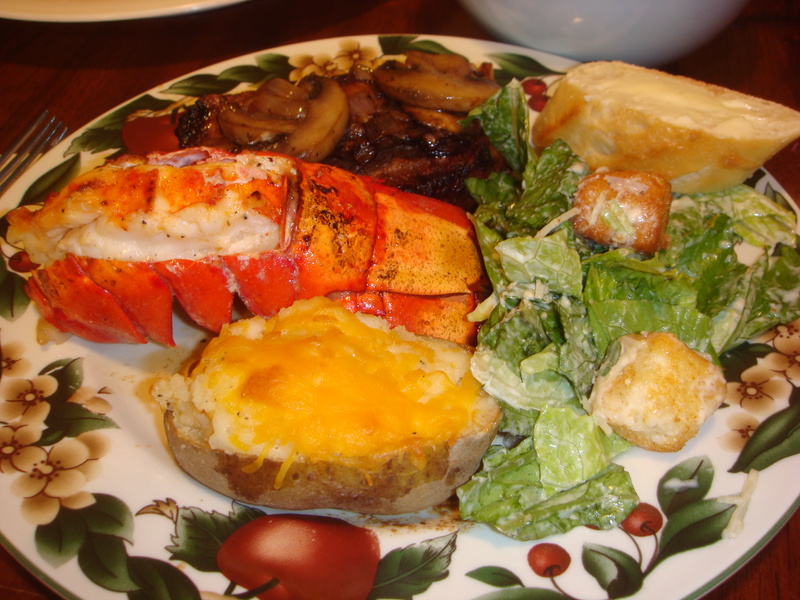 The main event is going to be steak with sauteed mushrooms, Caesar salad, broiled lobster tails and twice-baked potatoes. Good heavens. This is way better than I can get at our local steakhouse. For the steak, I marinated it overnight and then grilled it to yummy perfection. Mix all ingredients together and place steaks into freezer bag with marinade, preferably overnight. The original recipe used balsamic vinegar.Seems I never had that on hand so I just used white and listed that in the recipe, but balsamic is definitely better. Saute green onion in butter until tender. Stir in remaining ingredients; cook, uncovered, over low heat 30 minutes or until mushrooms are tender. Cover and process until creamy. Serve over torn lettuce with Parmesan cheese and croutons. For the lobster, I just looked a recipe up on the internet and used it. I don’t have lobster often enough to have a tried and true recipe. I’ll have to change this. Here’s one for you: Broiled Lobster Tail with Brown Butter Sauce. For the twice baked potatoes, I had no real recipe. If you need one, here’s a good one: Best Twice Baked Potatoes. Now after all of that wonderful, but quite substantial food, you need a very light dessert. Nothing too heavy. 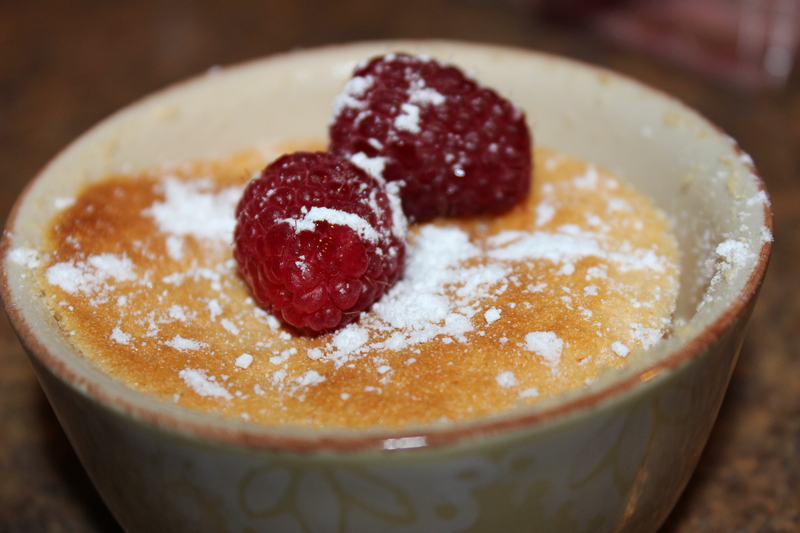 I present you with Raspberry-Lemon Custard Cakes. Fill a roasting pan with 1/2 inch of hot tap water; place in center of oven. Heat oven to 350 degrees. You’ll need eight 6 oz. custard cups; place 4 or 5 raspberries on bottom of each. Beat egg whites in a medium bowl with mixer on medium speed until foamy. Beat in 2 tbsp of the sugar until stiff, shiny peaks form when beaters are lifted. With same beaters (no need to wash), beat yolks and remaining sugar in a large bowl until mixture is light; beat in flour, extract, lemon zest and juice. Gradually beat in milk. Using a wire whisk, gently fold egg whites in yolk mixture just until combined. Divide batter among prepared cups (cups should be filled to the top). Place cups in hot water in roasting pan. Bake until puddings are puffed and golden brown on top, about 24 mins. Serve puddings warm or at room temperature, with confectioner’s sugar and remaining berries.